DHAKA: Bangladesh’s opposition party on Sunday said nearly 2,000 of its supporters have been arrested on trumped-up charges in a crackdown aimed at derailing its campaign just weeks from a general election. The Bangladesh Nationalist Party, which is seeking to unseat Prime Minister Sheikh Hasina on December 30, said at least 1,972 party officials and grassroots campaigners had been detained since the election was announced a month ago. 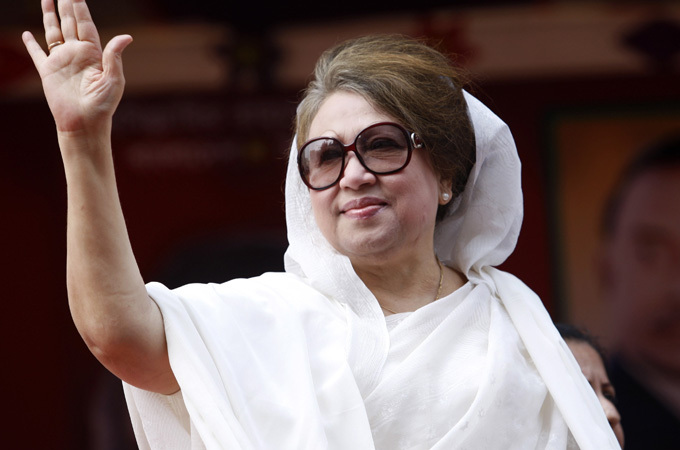 The arrests are yet another blow for a beleaguered opposition whose leader Khaleda Zia has been jailed for corruption and barred from running against arch-rival Hasina, who is seeking a third consecutive term. The opposition boycotted the 2014 election, saying it was rigged against Zia in favour of Hasina and her ruling Awami League party. BNP spokesman Rizvi Ahmed told AFP the majority of party cadres rounded up since late November in the police sweep were still behind bars. “They have filed hundreds of ghost, or fictitious cases, against our party workers and leaders,” he said. Another party official said at least 11 opposition candidates had also been detained before official campaigning begins on Monday. “Six of them are still in the jail,” said the official, who declined to be named. Police have said those arrested had outstanding warrants or were wanted over alleged connections to ongoing cases. Ahmed denied this, saying the crackdown was a political “blueprint” by the ruling party to intimidate its opponents. “The government wants to hold a lopsided election. These arrests are just to create fear among the people, so that they don’t go to vote,” he said. The opposition also accused police officials in Chittagong, a southern city, of campaigning on behalf of the Awami League. Police in the port city denied the allegations. The arrests further hinder an already battered alliance of opposition parties, led by the BNP, which have seen their core leadership jailed on charges they say are fabricated. Zia, a two-time former prime minister and friend-turned-foe to Hasina, was last month ordered by a court to stay behind bars for a decade for graft. Her supporters say the charges are politically motivated to stymie Hasina’s chief political threat. Zia’s son, a potential heir to the BNP throne, was sentenced in absentia to life behind bars while hundreds of other loyalists have been arrested or jailed, party officials say. Just a month from the polls, the BNP has not announced an alternative candidate to run against Hasina, whose rule has been marred by allegations of rights abuses and intolerance for dissent. Bangladesh has been led by either Zia or Hasina since the 1990s and the two powerful women have turned from close allies to fierce enemies. Hasina has refused to allow a caretaker government to oversee the country during the campaign period.